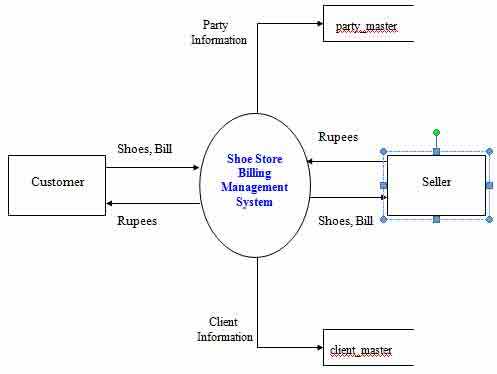 The main objective of Shoe Store Billing Management System is to Computerized the billing part of the Bata Store. This project developed using Visual basic 6.0 and Microsoft Access Driver. Existing system is based on manual work and all the process are done manually, so they maintain registers and files for recording all the details of the system. They maintain several registers for recording the entry of daily transactions such as billing of the shoes to the clients, etc. They maintain the record for their clients so they keep each and every information regarding their regular clients in the master file. In the similar fashion they maintain the records of their parties so they keep each and every information regarding their parties in the party master file. They keep the bill book or cash book to maintain the record for each sale of the shoe or transaction in the bata store. They also maintain the personal book for each clients for their personal transactions so when the after the month or year when the client comes for the payment they see the bock and make the bill. Similarly they maintain the book for their parties so they can pay the money to them after some time.Thus maintaining party information, client information , party transaction and all the things are done manually. The phase of system analysis process deals with problems which are Affecting in the current manual system . The problems are those which are Affecting the Bata store in it daily routine work. As the growing trend in InfoTech world of computers need of accuracy,Perfect ness , speed and high memory data storage is a must. Each and every Problem must be solved with a least amount of time and energy. Difficult in Maintenance of Records. Editing of data becomes a tedious job. Lack of Efficiency and Man Power. It is very difficult to maintain data record in the system as all the records are entered in the register or the respective record books. There are chances of the record books or files in which all the data is kept may be torn or wearied out or some other damages which results in the destroyed data. Also a problem occurs if the data file or register is misplaced somewhere else and is not getting at the time of actual requirement of the data stored. It is also difficult to maintain old files and registers which have data of past years which the ownes has kept for future references. The problem occurs when the sale of shoe is more and when the monthly report or bill is generated then the owner has to go through lots of record and which is very tedious task. It is very time consuming process to write each and every entry in the database register. Also it takes a lot of time if all the entries are repeated. In the system processes such as making different type of reports, billing, tedious calculations are examples of time consuming process in the system. It is also time consuming process to know the total number of sale done by the Bata store when written manually but through computerized system it takes less time as it is speedy and accurate. Manual written data cannot be changed or edited once written.If there is a mistake and if we try and write it makes the register very dirty and untidy, which creates a bad impression of the business . If data is entered incorrect whole document gets incorrect whole document gets incorrect while errors cannot be easily solved by editing wrongly entered data. If one had done some wrong entry then to edit the one has to go through lots of records and, again and again editing the record makes it difficult to read. As the data is stored in files or registers, it is not in a secure place. As the storage media here are files and books or registers there are chances of getting these storage media lost, torn, or it may go in the hand of wrong person which can destroy the database or it can also be destroyed accidentally. Also in the system data should be shown to the person according to his position and post in the office everybody should not be allowed to use all the data. If the data goes in the hand of wrong person then he/she may advantage of the data and the Bata store may go in loss. So security is the major aspects of the Bata store. After a certain time period if the user wants to checks his total billing or total profit or total expenditure or monthly sale than it becomes very tedious for the owner to check all the respectd data and according to the data creating respective report for the transactions. A computerized system having report making facility can do this job easily and also the owner can different types of charts and diagrams to make him understand the ups and downs of his Bata store.